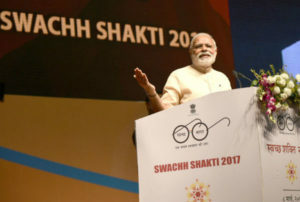 Gandhinagar: Prime Minister Narendra Modi, today addressed Swachh Shakti 2017 – A Convention of Women Sarpanches, at Gandhinagar. He said that this event is an occasion to honour Sarpanches who have contributed immensely to the movement towards a Clean India. He said that in 2019, we will mark the 150th birth anniversary of Mahatma Gandhi, who, he recalled, had stated that cleanliness is even more important than political freedom. He urged the gathering to maintain the momentum which has been generated towards cleanliness. The Prime Minister asserted that Swachhata, or cleanliness, has to be become our habit. He said the poor gain the most when we achieve cleanliness and eliminate dirt. 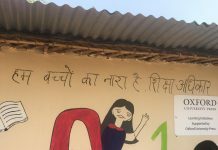 The Prime Minister said that the women who were being honoured today have shattered many myths, and have shown how a positive change has begun in rural India. Shri Narendra Modi asserted that he can see the determination to make a positive difference when he meets women Sarpanches, who, he added, wish to bring about a qualitative change. Talking about the ‘Beti Bachao, Beti Padhao’ initiative, he said that villages with women Sarpanches can play a key role in the drive to end female foeticide. The Prime Minister said that a discriminatory mindset cannot be accepted, and both boys and girls should get equal access to education. Speaking on the theme of technology, the Prime Minister said that it can bring about a phenomenal change to our villages. Congratulating the award winners, the Prime Minister said that they inspire the entire nation.